There are three senses in which a visual stimulus may be said to persist psychologically for some time after its physical offset. First, neural activity in the visual system evoked by the stimulus may continue after stimulus offset (“neural persistence”). Second, the stimulus may continue to be visible for some time after its offset (“visible persistence”). 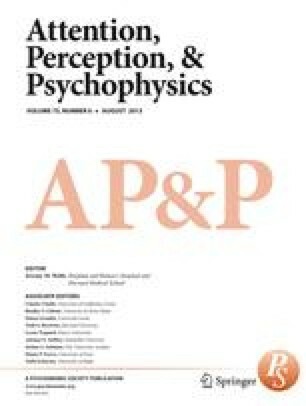 Finally, information about visual properties of the stimulus may continue to be available to an observer for some time after stimulus offset (“informational persistence”). These three forms of visual persistence are widely assumed to reflect a single underlying process: a decaying visual trace that (1) consists of afteractivity in the visual system, (2) is visible, and (3) is the source of visual information in experiments on decaying visual memory. It is argued here that this assumption is incorrect. Studies of visible persistence are reviewed; seven different techniques that have been used for investigating visible persistence are identified, and it is pointed out that numerous studies using a variety of techniques have demonstrated two fundamental properties of visible persistence: theinverse duration effect (the longer a stimulus lasts, the shorter is its persistence after stimulus offset) and theinverse intensity effect (the more intense the stimulus, the briefer its persistence). Only when stimuli are so intense as to produce afterimages do these two effects fail to occur. Work on neural persistences is briefly reviewed; such persistences exist at the photoreceptor level and at various stages in the visual pathways. It is proposed that visible persistence depends upon both of these types of neural persistence; furthermore, there must be an additional neural locus, since a purely stereoscopic (and hence cortical) form of visible persistence exists. It is argued that informational persistence is defined by the use of the partial report methods introduced by Averbach and Coriell (1961) and Sperling (1960), and the term “iconic memory” is used to describe this form of persistence. Several studies of the effects of stimulus duration and stimulus intensity upon the duration of iconic memory have been carried out. Their results demonstrate that the duration of iconic memory is not inversely related to stimulus duration or stimulus intensity. It follows that informational persistence or iconic memory cannot be identified with visible persistence, since they have fundamentally different properties. One implication of this claim that one cannot investigate iconic memory by tasks that require the subject to make phenomenological judgments about the duration of a visual display. In other words, the so-called “direct methods” for studying iconic memory do not provide information about iconic memory. Another implication is that iconic memory is not intimately tied to processes going on in the visual system (as visible persistence is); provided a stimulus is adequately legible, its physical parameters have little influence upon its iconic memory. The paper concludes by pointing out that there exists an alternative to the usual view of iconic memory as a precategorical sensory buffer. According to this alternative, iconic memory is post-categorical, occurring subsequent to stimulus identification. Here, stimulus identification is considered to be a rapid automatic process which does not require buffer storage, but which provides no information about episodic properties of a visual stimulus. Information about these physical stimulus properties must, in some way, be temporarily attached to a representation of the stimulus in semantic memory; and it is this temporarily attached physical information which constitutes iconic memory.